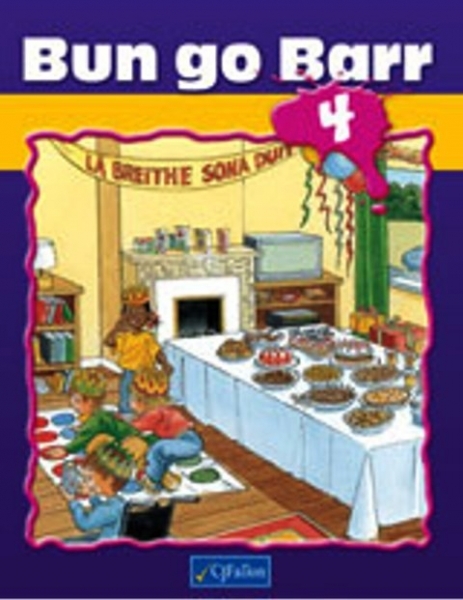 • Bun go Barr 4 is for use in Fourth Class. • Units are introduced either by means of poster-style two-page-spreads or by two pages of comic-strip stories. Each unit includes solid reading, writing, comhrá, vocabulary development and grammar presented in a fresh, methodical, pupil-friendly approach. • Revision is built in through monthly Súil Siar sections and a summary of grammar and vocabulary used is given at the end of the book. • A new feature of this book is the introduction of a full-length drama dealing with An Nollaig.